Ecosystems are dynamic interrelated collections of living and non-living components organized in self-regulating units. An ecosystem is a unit because it has boundaries and can be distinguished from its surroundings. The living and non-living components affect each other in complex exchanges of energy, nutrients and wastes. It is these dynamic exchanges, both fast and slow, which provide ecosystems with their distinct identities. Because of these distinct features ecosystems themselves represent part of the earth’s biodiversity. 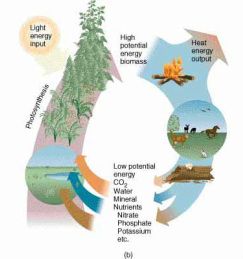 The characteristic exchanges within an ecosystem are called ecosystem functions and in addition to energy and nutrient exchanges, involve decomposition and production of biomass. The complex interdependencies which develop within or among ecosystems often create emergent properties, or characteristics that cannot be predicted from the component parts alone. Open systems tend to exist in a state of balance or quilibrium. Equilibrium is important for a system as it avoids sudden changes in a system. However, this does not mean that all systems are none changing. If change exists it tends to exist between certain peramiters. Equilibrium states in two ways state and steady. Static Equilibrium is a system in a steady state because the inputs and outputs that affect it approximately balance over a long period of time. The laws of thermodynamics govern the flow of energy in a system. This flow of energy gives the system the ability to do work. Systems can exist in alternative stable states or as equilibria between which there are tipping points. Destabilizing positive feedback mechanisms will drive systems toward these tipping points, whereas stabilizing negative feedback mechanisms will resist such changes. This unit will take a minimum of 3 hours. The principle of conservation of energy can be modeled by the energy transformations along food chains and energy production systems: what are the strengths and limitations for such models? How do the delays involved in feedback loops make it difficult to predict tipping points and add to the complexity of modelling systems? Do the benefits of the models used to predict tipping points outweigh their limitations? How does sustainability reduce the change that tipping points will be reached? 1st: energy is neither created nor destroyed, only changes forms. This is the principle of conservation of energy, Energy in an isolated system can be transformed but cannot be created or destroyed. 1.3.U2 The principle of conservation of energy can be modelled by the energy transformations along food chains and energy production systems. The principle of conservation of energy states that energy cannot be created or destroyed, i.e. in an isolated system, the total energy before transformation is equal to the total energy transformation. Energy can only be changed from one form to another. 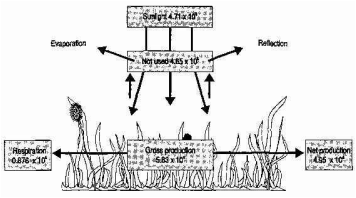 Energy for the functioning of an ecosystem comes from the Sun. Solar energy is absorbed by plants where in it is converted to stored chemical energy. 1.3.U3 The second law of thermodynamics states that the entropy of a system increases over time. Entropy is a measure of the amount of disorder in a system. An increase in entropy arising from energy transformations reduces the energy available to do work. The second law of thermodynamics states that whenever energy is transformed, there is a loss energy through the release of heat. Entropy of a system increases overtime. Entropy is a measure of the amount of disorder in a system. An increase in entropy arising from energy transformations reduces the energy available to do work. 1.3.U4 The second law of thermodynamics explains the inefficiency and decrease in available energy along a food chain and energy generation systems. 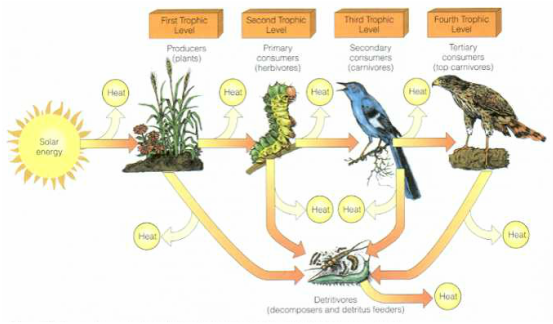 This occurs when energy is transferred between trophic levels as illustrated in a food chain When one animal feeds off another, there is a loss of heat (energy) in the process. Additional loss of energy occurs during respiration and movement. Hence, more and more energy is lost as one moves up through trophic levels. This fact lends more credence to the advantages of a vegetarian diet. For example, 1350 kilograms of corn and soybeans is capable of supporting one person if converted to beef. However, 1350 kilograms of soybeans and corn utilized directly without converting to beef will support 22 people! 1.3.U5 As an open system, an ecosystem will normally exist in a stable equilibrium, either in a steady-state equilibrium or in one developing over time (for example, succession), and maintained by stabilizing negative feedback loops. As an open system, an ecosystem will normally exist in a stable equilibrium, either in a steady state equilibrium or in one developing over time (for example Succession), and maintain y stabilizing negative feedback loops. Steady-state: in open systems, continuous inputs and outputs of energy and matter, system as a whole remains in a constant state, no long term changes. There may be oscillations in the very short term. 1.3.U6 Negative feedback loops (stabilizing) occur when the output of a process inhibits or reverses the operation of the same process in such a way as to reduce change—it counteracts deviation. Ecosystem feedback is the effect that change in one part of an ecosystem has on another and how this effect then feeds back to effect the source of the change inducing more or less of it. These feedback loops form the basic dynamics for regulating the state of the ecosystem. In order for a system to maintain a steady state or average condition the system must possess the capacity for self-regulation. Self-regulation in many systems is controlled by negative feedback and positive feedback mechanisms. Negative-feedback mechanisms control the state of the system by dampening or reducing the size of the system's elements or attributes. Positive-feedback mechanisms feed or increase the size of one or more of the system's elements or attributes over time. Negative (stabilizing): tends to neutralize or counteract any deviation from an equilibrium and tends to stabilize systems. 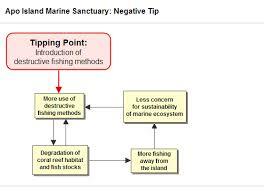 The systems gets better or goes back to normal..
Resistance to drastic changes and thus stability in natural ecosystems are maintained in part by negative feedback systems. These are familiar to you through considering the system that regulates the heat in your home. When the temperature in your house decreases below some set point, the thermostat that senses temperature is activated to send a "turn on" message to your furnace. Then, once the temperature rises above another set point, the thermostat sends a message to the furnace, telling it to shut off. Thus, the temperature in your house is maintained within bounds. This illustrates a negative feedback system. Negative feedback systems act to maintain homeostasis within systems; that is, to keep them in a reasonably constant state. 1.3.U7 Positive feedback loops (destabilizing) will tend to amplify changes and drive the system towards a tipping point where a new equilibrium is adopted. Positive (destabilizing): results in a further decrease of output and the system is destabilized and pushed into a new state of equilibrium. The situation gets worse. Positive feedback stimulates change and it is responsible for the sudden appearance of rapid changes within ecosystems. When part of the system increases, another part of the system also changes in a way that makes the first part increase even more. Positive feedback is a source of instability and change as it can drive the system outside of its equilibrium. As an example more population leads to more births, and more births lead to an increasing population creating a compounding effect over time. ​The self-regulation of natural systems is achieved by the attainment of equilibrium through feedback systems. Feedback links involve time lags. A tipping point is a critical threshold when even a small change can have dramatic effects and cause a disproportionately large response in the overall system. Positive feedback loops are destabilizing and tend to amplify changes and drive the system towards a tipping point where a new equilibrium is adopted. Most projected tipping points are linked to climate change and represent points beyond which irreversible change or damage occurs. Increases in CO2 levels that would lead to increased global mean temperature, causing melting of the ice sheets and permafrost. Reaching such a tipping would, for example, cause long-term damage to societies, the melting of Himalayan mountain glaciers, and a lack of freshwater in many Asian societies. it, causing it to reach a new equilibrium or stable state. 1.3.U9 Diversity and the size of storages within systems can contribute to their resilience and affect their speed of response to change (time lags). The more diverse/complex an ecosystem, the more resilient it tends to be (more interactions between species). The greater the species biodiversity of an ecosystem, the greater the likelihood there is a species that can replace another if it dies (to maintain equilibrium). The greater the genetic diversity within a species, the greater resilience. 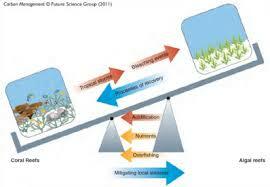 A monoculture of wheat or rice can be wiped out by disease if none of the plants have genetic resistance. Species that can shift geographic ranges are more resilient. The climate affects resilience. In the Arctic, regeneration/growth of plants is slow (low temps slow down photosynthesis/cell respiration). In tropical rain forests, growth rates are fast (light, temp, water are not limiting factors). The faster the rate at which a species can reproduce means recovery is faster. r-strategists (fast reproductive rate) can recolonize the system better than K-strategists (slow reproducers). [Examples of human impacts and possible tipping points should be explored]. Humans can remove or mitigate threats to the system (pollution, invasive species) – resulting in faster recovery. Humans can reduce size of storages by harvesting wood, fish and other natural resuources. Humans can also reduce diversity by species extinction which leads to less resilience. ​1.3.A1 Explain the implications of the laws of thermodynamics to ecological systems. Resilience is the capacity of an ecosystem to respond to a disturbance. 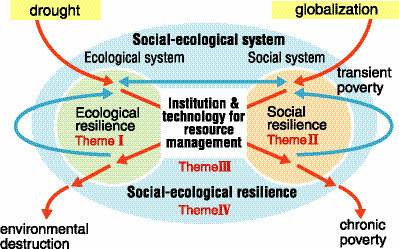 Resilience is usually defined as the capacity of an ecosystem to absorb disturbance without shifting to an alternative state and losing function and services. Disturbances can include fires, flooding, windstorms, insect population explosions, and human activities such as deforestation, fracking of the ground for oil extraction, pesticide sprayed in soil, and the introduction of exotic plant or animal species. Some disturbances can significantly affect an ecosystem and can cause an ecosystem to reach a threshold beyond which some species can not recover. 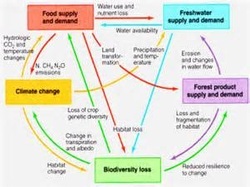 Human activities that adversely affect ecosystem resilience such as reduction of biodiversity, exploitation of natural resources, pollution, land-use, and anthropogenic climate change are increasingly causing changes in ecosystems, often to less desirable conditions. The resilience of a system, ecological or social, refers to its tendency to avoid such tipping points and maintains stability. A tipping point is the minimum amount of change within a system that will destabilize it, causing it to reach a new equilibrium or stable state. An environmental tipping point is a part of the human-environment system that can lever far-reaching change in the system. A change at the tipping point sets in motion mutually reinforcing feedback loops that propel the system on a completely new course. Extinction of a Keystone Species: Removal of elephants from a savannah ecosystem can result in irreversible damage to that system. Coral Reef Death: If ocean acidity levels increase, the reef coral dies and cannot regenerate. You need to understand the relationships between resilience, stability, equlibria and diversity using specific examples to illustrate interactions. The us of models facilitates international collaboration in science by removing language barriers that may exits. The laws of thermodynamics are examples of scientific laws - in which ways do scientific laws differ from the laws of human science subjects, such as economics? This video is about how we don't just need energy to power our lives, we need *low entropy* energy! This is also known as "free energy", and one way of thinking about entropy is as the lack of free energy. The sun provides us with useful, low entropy, energy in the form of photons of visible light, which are then absorbed and converted into plants, sugar, complex molecules, etc, before being radiated back into space as heat, which has much higher entropy. This video explains the 1st and 2nd laws of thermodynamics as they relate to energy exchanges with environmental systems. Paul Andersen explains how ecosystems respond to disruptions. Disruptions can cause changes in the number and variety of organisms. It can also lead to migration, extinction or even speciation. "A short animated film about the feedback loops likely to lead to catastrophic climate change, by Leo Murray." From time to time, ecosystems are hit by storms, fires or other types of disturbance. Resilience is the ability of an ecosystem to resist or recover from these events. Resilience preserves ecosystem diversity, productivity and sustainability. Disturbance has more impact on ecosystems that have lost diversity. This segment deals with the main positive feedback loops in action in Gaia's complex ecosystems: melting of the ice caps, deforestation, melting of permafrost regions of the planet and the destruction of Ehux: a vital marine algae that is a key component of the earth's climate regulation system. The scientific evidence appears (overwhelmingly) to indicate that earth (Gaia) may be inexorably approaching or perhaps PAST the tipping point and on it's way to a new climate regime not seen on earth for 55 million years. It will be a climate that is, on average, much hotter, more chaotic and violent than what we have experienced for the entire tenure of our species. Plenty of people have an opinion on whether the precautionary principle is good or bad, but what exactly is it?